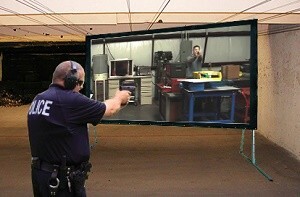 The Video Scenario Trainer Pro is an add-on to the Smokeless Range® for high-end professional training. Add the Video Scenario Trainer Pro to practice use-of-force and situational awareness in video based scenarios that can have multiple outcome possibilities. The software plays HD videos that can branch to different outcomes depending on how the trainee responds to the situation or instructor input. Video Scenario Trainer comes standard with over 65 pre-loaded scenarios. 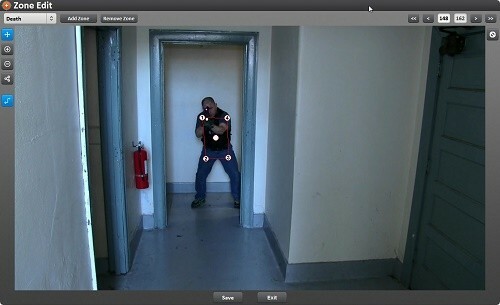 Build your own videos to practice use-of-force training and situational awareness. HD videos and a full branching editor allows for different outcomes. 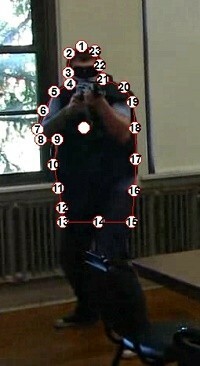 The video trainer includes an after action replay review function that will pause when each shot is detected. Instantly, the shot location will be displayed for your review. The VST Pro is a high end tool designed for an instructor to use while training a student. It requires input from the instructor who is familiar with the scenes to produce the best training results. Try, before you buy. Download the Pro Judgmental Video Trainer for a FREE Trial. Please be advised that this demo is for use with your computer mouse only unless you already own the Smokeless Range®. **The VST-Pro is available only as an add-on to the Smokeless Range®. Customers must have the Smokeless Range® and camera in order to use this software. The Video Trainer Pro comes standard with a powerful scene and zone editor that allows you to create your own scenarios. The zone editor allows for precise hit zones to be placed over threats in the scene so that only shots that strike the hit zone will cause the scene to respond and branch. The branching video editor is exclusive to the Pro version. The VST Pro is a high- end tool that designed for firearms instructors to help their students with a real-life use of force situations. In order to get the best training results, the software requires input from the instructor who is familiar with the different seances and can decide on the correct ending of each scenario according to the student needs. Upload specific videos from your local school, parking lot, grocery store or department. Build your own scenarios with different situations. Replay the movie to see your shots and learn from your mistakes (AAR). Use with your own gun, recoil gun or with the Advanced Training Laser Pistol. The VST Pro Editor requires a minimum desktop resolution of 1600x900. The editor can be loaded to a different PC than the player if necessary. The Video Scenario Trainer PRO is NOT a standalone Simulator but an add-on to the Smokeless Range® Simulator. You will need to purchase the Smokeless Range®Simulator before you purchase the Video Scenario Trainer Pro. Please check the computer requirements for this product. For shooters using the Video Scenario Pro and would like to edit their videos before uploading it to the Simulator Editor, below you will find a few recommendations for a free, powerful video editor.